I discovered this author a few years ago when I went to the library. I love her writing. Simple, fun, and mysterious. She has wrote a ton of books. It will take me forever to read them all because I like to mix up my authors since there are many good ones. This year I am going to read both ebooks and the good ole hand around the book. Last year I read mostly ebooks because there are many new authors and I couldn’t stop downloading them. I didn’t make my reading goal last year but I have a good feeling that I will this year. This entry was posted in Ramblings and tagged author, books;, download, ebooks, goal, library, read, Writing. Bookmark the permalink. Journal Dec 29-Jan 3 2015, That 5 Year Thing Again. I bought a few of her books after I received a positive review on my new series that included this line: “Aspiring detective Jo Ravens is the new Agatha Raisin, US style.” I haven’t had a chance to read her books yet, but I think I’ll put one next in the queue. Thanks for reminding me. I have about 300 hardcover books that are begging to be read. They are mostly 1990’s and older. Like you, I’m rotating between newer Kindle books and my hardcovers. I still love holding and reading a book (and smelling the new ones). I’m off to a good start this year with three books finished and halfway through the fourth. Cool review. I love hardcover books the most. Funny most of the books I have bought are from the 90s. It was the decade I worked alot and did not read much other textbooks. I use to subscribe to book of the month clubs and Harlaquin series. I have read three but two had been started last year. I have a Nook and then the Kindle app so I am prepared whenever there is down time. Lol. Great to see you back blogging! I see why you took a break with all your comments people write on your blog. You are great at getting them answered. Happy reading and finishing those books. 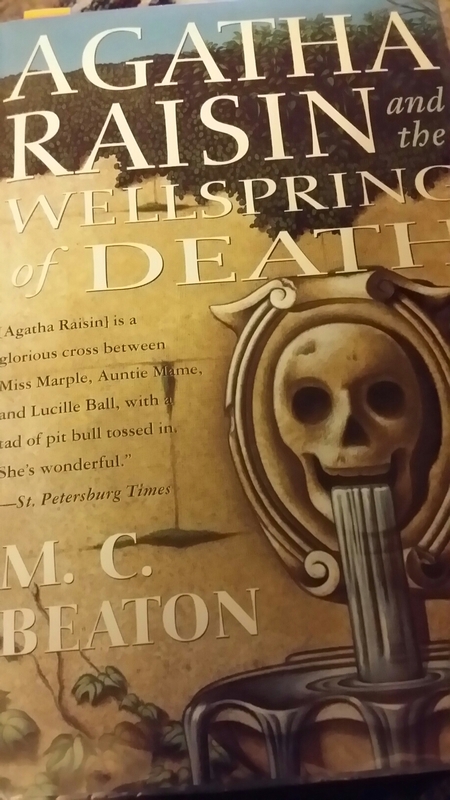 Once you’ve read your way through the Agatha Raisin books, you might want to try MC Beaton’s Hamish Mcbeth. Beaton is one terrific writer. Hi Jules. Going back to my kitchen stove now. Thanks I have all those wrote down in my to read book. Have fun in the kitchen. Great to hear from you. Thanks for the tip. I just requested the first book in her series from my book club, Paperback Swap. By the way, if you read as much as I do, Paperback Swap is a nice, inexpensive way to put many books into your hands. That’s a neat book club, I will remember that. Thanks. Enjoy. I’ve never downloaded an ebook yet, but I am into the audio books. I use Audible and I’m currently listening to the book “Wild”. I saw the movie, but the book is much more detailed. Great post!